I’m used to seeing tons of chocolate cup options. I have seen Sunbutter cups, almond butter cups, peanut butter cups, but never a chocolate cup option that tastes like a Girl Scout cookie! My original goal was not this creation. I set out to make a healthy salted caramel filling using natural ingredients like dates, and well, I just haven’t nailed it yet. Instead, I began to create what I thought would become this salted caramel idea, and then it manifested into something completely different, and utterly delicious. So I went with it. I birthed Healthy Samoas Girl Scout Cups without setting the intention. My intention was to make something delicious. And delicious this is! I call this a cookie and a candy. It’s an all in one. 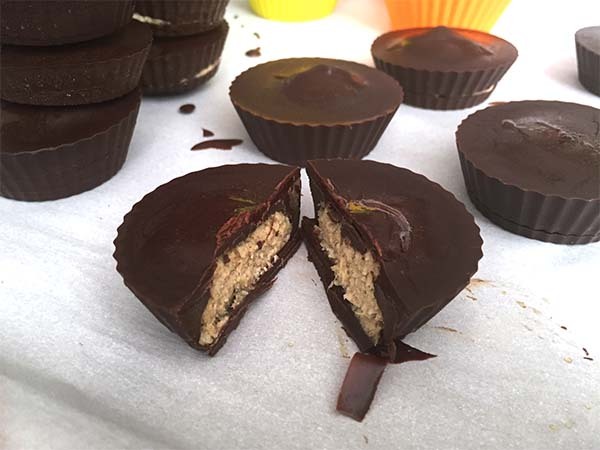 And it tastes just like those old school Samoas Girl Scout cookies we all drool over, but THIS is a healthier version that you do not need to feel guilty about. I always loved Girl Scout Cookies, who doesn’t? I think that scene in the 1989 movie Troop Beverly Hills “It’s Cookie time, cookie time, cookie time-cookie-time…”, starring Shelly Long sold me on Girl Scout Cookies. The coconut combination with the sugary caramel always made my heart swoon. Those cookies literally blew my mind in the taste department. Then I went gluten-free. Then I overindulged in lots of sugar and developed lots of other medical issues over time where sugar consumption was the culprit. By the time the gluten-free version came out, I could no longer justify those unhealthy ingredients. So take my Healthy Samoas Girl Scout Cups and feel guiltless. I only used 4 totally natural ingredients and 5 if you count the sea salt. Ready for the ingredient lineup? Coconut-super sweet on it’s own, and it’s unsweetened! Also cures sugar cravings and keeps the blood sugar low. Dates-a natural plant based sweetener, actually a fruit, good fiber and tastes like caramel! Pumpkin Seeds (tis the season) – these little seeds are bomb – first they are a great source of plant based protein and secondly, they are a perfect seed for the Fall season. Chocolate – not just any chocolate. Dark chocolate. The kind that is a high cacao content of 72 percent or higher, and the type that is only sweetened with coconut sugar or sugar-free. Dark chocolate is loaded with magnesium, which promotes muscle relaxation and better sleep, but since there is caffeine in chocolate, I do not suggest large consumption in the evening. Sea Salt – preferably Celtic Sea Salt, but if you don’t have this, any Sea Salt will work too. And all you need is a food processor and cupcake liners. And guess what? I made these in Lollipop form too! 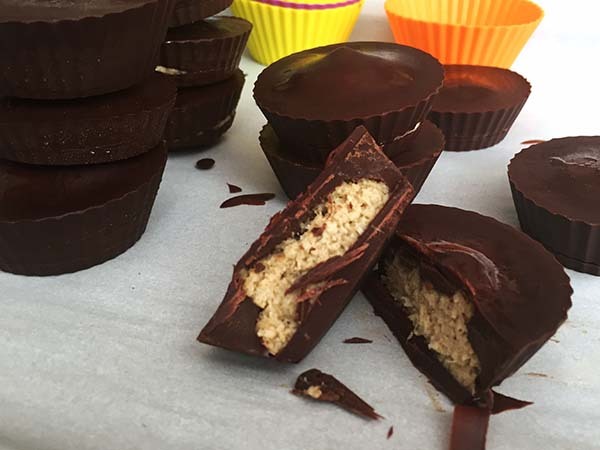 But, the directions were too long to put both recipes in one article, without utter overwhelm, and so the decision to create an entirely separate post for these Healthy Girl Scout Samoas Cups came to fruition. The attention spans of our generation solidified my decision to separate these two recipes. After all, I want it to be easy for you guys. These are ridiculously delicious, and from my perspective really easy to make, but I realized in order to show just how special this dessert is, I had to put it on it’s own pedestal and separate the posts. 1. Ahead of time – soak the dates (pitted) in water for a minimum of 6 hours. In or out of the fridge. 3. Then in intervals add the pumpkin seeds, coconut and sea salt into the food processor and blend until all ingredients are broken down and blended well. This will require you to open it up a few times and scrape the sides. 4. Scoop mixture into a container and freeze for half an hour to an hour. If the mixture is still too sticky to form into balls, then freeze for longer. 5. Melt the chocolate in a double boiler on medium heat or a microwave. To thin the chocolate and make it easier to pour you can use a few teaspoons of coconut oil (1-3). 6. Line a cupcake pan with foil cupcake liners. Spoon the melted chocolate into the lined cups, filling each about one-quarter full. Place in the freezer to set, about 10-15 minutes. 7. Take a heaping teaspoonful of the Samoas mixture and roll it into a ball. Flatten slightly and place on top of the set chocolate in a foil liner. Repeat with remaining samoas mixture. 8. Scoop the remaining melted chocolate on top of the samoas mixture in the cups, being sure to cover it completely. This is where you may need to add coconut oil to your chocolate mixture to thin it out a bit before pouring it on top. 9. Tap the pan on the countertop to even out and smooth the chocolate. Place in the freezer until set. Store these Samoas Cups in the freezer or refrigerator in a sealed container until ready to eat. If you want a more moist center, then you will want to soak half of the pumpkin seeds for 6 hours, drain them and then add that half to the food processor with all the other ingredients. This version creates a smoother inside. The perfect healthy dessert you don't have to feel guilty about. Gluten-Free, Dairy-Free, Nut-Free, Grain-Free, Paleo, Vegan and No added or refined sugar. Ahead of time - soak the dates (pitted) in water for a minimum of 6 hours. In or out of the fridge. Then in intervals add the pumpkin seeds, coconut and sea salt into the food processor and blend until all ingredients are broken down and blended well. This will require you to open it up a few times and scrape the sides. Scoop mixture into a container and freeze for half an hour to an hour. If the mixture is still too sticky to form into balls, then freeze for longer. Melt the chocolate in a double boiler on medium heat or a microwave. To thin the chocolate and make it easier to pour you can use a few teaspoons of coconut oil (1-3). Line a cupcake pan with foil cupcake liners. Spoon the melted chocolate into the lined cups, filling each about one-quarter full. Place in the freezer to set, about 10-15 minutes. Take a heaping teaspoonful of the Samoas mixture and roll it into a ball. Flatten slightly and place on top of the set chocolate in a foil liner. Repeat with remaining samoas mixture. Scoop the remaining melted chocolate on top of the samoas mixture in the cups, being sure to cover it completely. This is where you may need to add coconut oil to your chocolate mixture to thin it out a bit before pouring it on top. Tap the pan on the countertop to even out and smooth the chocolate. Place in the freezer until set, about 1 hour. Store these Samoas Cups in the freezer or refrigerator in a sealed container until ready to eat.